Like a fashionably late and flamboyantly dressed party guest, the annual Okavango inundation has unmistakably arrived here in our corner of the Delta. It has brought with it a sometimes cacophonous, sometimes mellifluous chorus of frogs and lesser-seen wetland birds, including striking species such as wattled crane and pink-backed pelican. Each day, the water, having already made the 1 200+ km journey from the Angolan highlands, moves further into the Abu Concession and beyond, ultimately to lose itself in the sands of the Kalahari. The water now stretches from the permanent lagoon east of Abu Camp to the very margins of our island, enticing buffalo and hippo closer and creating an even more tranquil setting for meals and relaxing moments. The camp itself has been spruced up and, more than ever, reflects a picture of comfort, style and elegance. A moving moment of a different but no less significant kind took place recently when long-standing Abu Camp guests and close friend, Iva Spitzer, visited us to catch up with the Abu Herd and plant a baobab tree in memory of the late Russel Friedman. Russel was a co-founder of Wilderness Safaris, founder of the Wilderness Trust and chairman of Children in the Wilderness, and the planting of this slow-growing tree (which will be watched over and nurtured by the Abu Camp staff) ensures that the memory of this very special person will live on at Abu Camp for many years to come. Numerous travel agents from across the globe visited Abu Camp this month, lured to Africa by the Africa Travel Indaba in Durban and We Are Africa travel show in Cape Town. They were not the only exotic species on the wing over the Delta: with the cooler winter temperatures setting in, several of our migrant bird species, such as woodland kingfisher, carmine bee-eater and yellow-billed kite have moved north to warmer climes. The Abu Herd, swollen by two new arrivals already this year, continues to do well. Calves Shamiso (two months old) and Motlotlo (five months) have been keeping guests and elephant handlers amused with their playful antics. Whether it be the sight of the youngsters charging cheekily at the handlers with ears held forward, “all a-tremble with their own daring,” pushing or climbing over one another, or just going about their business innocently exploring their new world, the pair of them inadvertently provoke unbridled joy in everyone they meet. Although more than capable of entertaining themselves separately, they appear to thoroughly enjoy playing with each other. Shamiso, although younger, is often the initiator of the games. When Motlotlo becomes a little too boisterous for his noticeably smaller playmate there is always an older elephant on hand to intervene. For his part, Shamiso is growing stronger and more confident each day and doesn’t seem to mind the roughhousing. We’ve had some really interesting questions via social media about how the other members of the Abu Herd have reacted to the arrival of two calves in their midst. Warona and Naledi have become very protective over the new babies and they both take very good care of them, acting almost as ‘babysitters’ on occasion (although happily, not literally). Naledi – who until the start of this year was the undisputed ‘rockstar’ of the Abu Herd – has been alternately jealous and protective of Motlotlo and Shamiso. At first, it was difficult for anyone to photograph Motlotlo as Naledi was always getting in the way. She does put on a show once in a while, rolling on her back and swinging her head and trunk to get attention when she realises that guests are giving the babies more of their time. 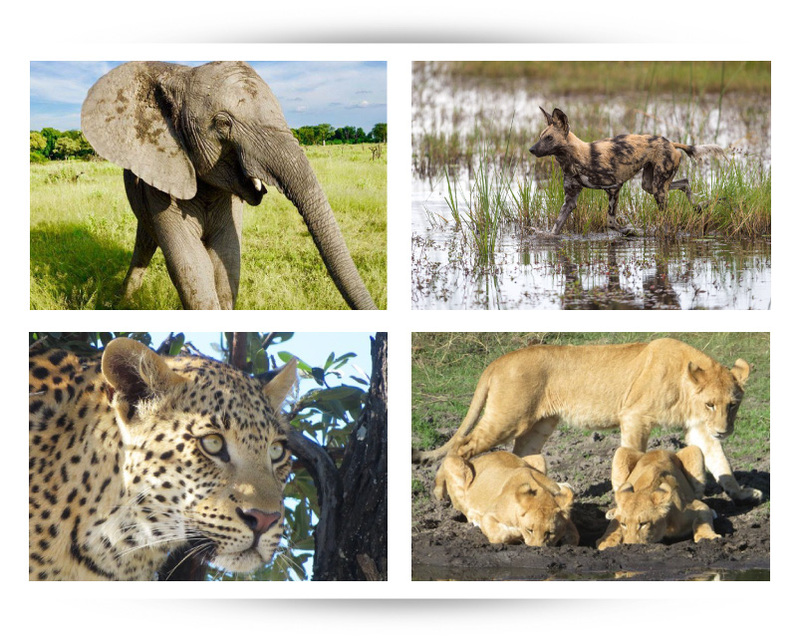 Further afield, our guests have been enthralled by attempted hunts, kills and stolen carcasses. A hunting pack of wild dog was followed then lost in the thickets only to be found again feeding on a kudu. Attracted by the excited calls, a hyaena arrived to steal the spoils but the dogs were having none of it – and letting her have the same. A few whooping calls from the hyaena brought in some back-up, however, and together the three clan members were able to take over what was left of the carcass. Another sighting featured our resident female leopard, Bame, who had killed a tsessebe calf, and was calling to her now sub-adult offspring. The young leopard appeared and the two began feeding. Not for long, however, as a large male leopard arrived and commandeered the calf. Another male leopard, Rradipheba, was observed with both buffalo and impala carcasses during the month, whilst the very old female, Bonolo, was found with a porcupine quill lodged in her neck. Whether or not her encounter with the prickly rodent had at least resulted in a meal for Bonolo remains unknown. We also witnessed a rare encounter between a leopard and a honey badger, ending with the leopard moving off, unwilling to tangle with the indignant mustelid. Lion sightings have also been plentiful. Some fortunate guests observed the Abu Pride stalking a buffalo, though the lion were detected, and the even more fortunate buffalo managed to escape to an open area where further hunting attempts would have been futile. Tapologo Gaothobogwe and Batsholelwang Mothlakola. PS. 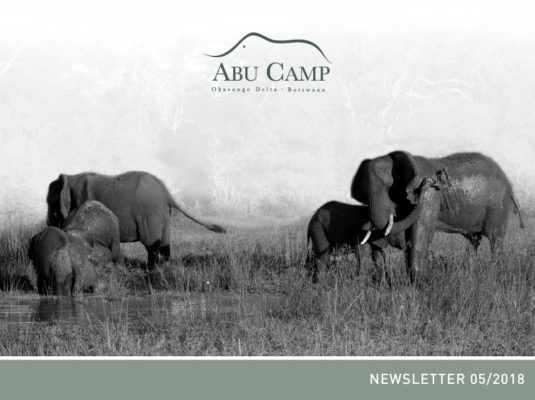 Thanks to Kylie McQualter from the Wilderness Safaris Environmental Department, who has recently spent time conducting environmental compliance audits at Abu Camp (we passed! ).